If you or your loved one has a condition that requires more hands-on care, our nursing care homes offer 24-hour support. You’ll have the benefit and assistance you get from living in a residential care home, with additional nursing care. Some of our care homes provide specialist care for specific conditions such as dementia, Huntington’s disease and young physical disabilities. Find out more about the different types of care we offer. 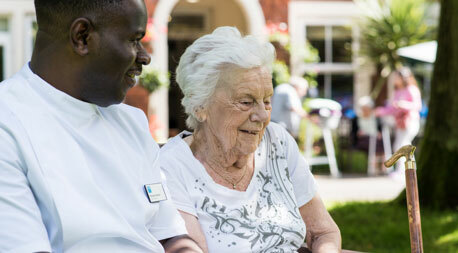 Our person-centred approach to nursing care means that you will be respected as an individual and treated with dignity. All our residents have their own personal care plan, which recognises their individual needs and wishes, and allows us to tailor our care to their likes and dislikes. We also ask you, your friends and family to help us to create a plan called ‘my day, my life, my story’. This records your life story and helps us to get to know you and the things that are most important to you when you arrive. The price you’ll pay for care will depend on the type of support and accommodation you need, and the length of your stay. In many of our care homes, there are additional treatments and services available such as hairdressing, physiotherapy, chiropody and aromatherapy. Speak to a care home manager to get more information, including any additional costs.